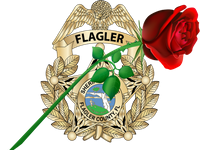 January 19th, 2018 marked the second annual Sheriff’s Gala to benefit the Flagler Sheriff’s Employee Assistance Trust (FSEAT). The event was held at the Hammock Beach Resort and was attended by nearly 300 guests. Some of the top sponsors of the evening included Summit Nutritionals International and Dr. Caesar DePaço, who is also the Honorary Consul of Portugal, the Douglas Family, and the Hammock Beach Resort. There was also a live auction for artwork, a day with the FCSO SWAT team, two ride-alongs with Sheriff Staly, a signed cowboy hat, and a chance to ride in a Ferrari around the Daytona Speedway track in which an additional $12,150.00 was raised for FSEAT. Sheriff Rick Staly also took the opportunity to recognize members of the Flagler County Sheriff’s Office, volunteers and citizens for outstanding service to the community in 2018. Sheriff Staly presented awards for Law Enforcement Deputy of the Year, Detention Deputy of the Year, Civilian Employee of the Year, Volunteer of the Year, and Citizens of the Year. FSEAT gifted each award recipient with tickets to the Gala for themselves and one guest. Deputy Austin Chewning consistently goes above and beyond in the performance of his duties, remaining proactive throughout his shifts by conducting traffic enforcement, making arrests and seizing narcotics. For his consistent dedication to keeping our community a safer place, Deputy Chewning is FCSO’s 2018 Law Enforcement Deputy of the Year. Detention Deputy Sheria Woods exhibited bravery beyond measure when she was involved in an altercation with an inmate on March 25th, 2018. Deputy Woods stood her ground and engaged in an aggressive physical altercation in order to prevent this inmate from harming the nurse who was present. During the altercation, Deputy Woods radio was knocked off and she had to use her defensive tactics knowledge to gain control of the situation until she could call for assistance. During this altercation, Deputy Woods displayed exceptional courage and selflessness. For this Deputy Sheria Woods is FCSO’s 2018 Detention Deputy of the Year. Police Athletic League Coordinator Kerri Henderson works tirelessly for the youth of Flagler County. She helped organize and run the National Night Out event and was instrumental in making it a success. Kerri also runs the McGruff Club with our youth. She teaches 45 children about safety as well as going to elementary schools with the SRD’s and talking about Stranger Danger to kindergarteners. Kerri is a reminder that with hard work and dedication, we can make a difference in our youths’ lives. For this reason Kerri Henderson is FCSO’s 2018 Civilian Employee of the Year. Angela Camit is an active member of the Citizens Observer Patrol. While on patrol, C.O.P. Camit reported to deputies that a man armed with a 20-inch knife was trying to gain entry into her vehicle. When that attempt failed, the man fled on foot. Instead of retreating, C.O.P. Camit followed the man and assisted deputies in locating him. C.O.P. Camit’s bravery and dedication to serving her community resulted in the quick arrest of this criminal. For her actions and dedication C.O.P. Angela Camit is FCSO’s 2018 Volunteer of the Year. Anthony and Dawn Butrym were the first volunteers to enter the search for missing and endangered juvenile Rickey Wheeler. Their participation in the structured volunteer search would prove to be significant when they discovered articles of Rickey’s clothing that would lead deputies to his location. Had it not been for this discovery, Rickey might not have survived. For their compassion for others and selfless nature, Mr. and Mrs. Butrym are FCSO’s 2018 Citizens of the Year. Over $76,000.00 was raised for FSEAT to benefit the men and women of the Flagler County Sheriff’s Office. The purpose of FSEAT is to provide financial assistance to FCSO employees during a personal crisis, in support of a slain deputy’s family, and to recognize FCSO deputies killed in the line of duty. The 3rd Annual Sheriff’s Gala is scheduled for January 18, 2020 at the Hammock Beach Resort.